Do you have a boat for sale? Do you want to list it in PassageMaker Magazine? Please contact Cathy Breen at cbreen@aimmedia.com or (203) 994 - 4640. We have two different kinds of for-sale ads. 1) Standard ads; which are one image, title, and text. 2) Larger ads; which are full page, half page, quarter page, and eighth pages. Can I just do an online ad? All of our listing includes print, not just online. 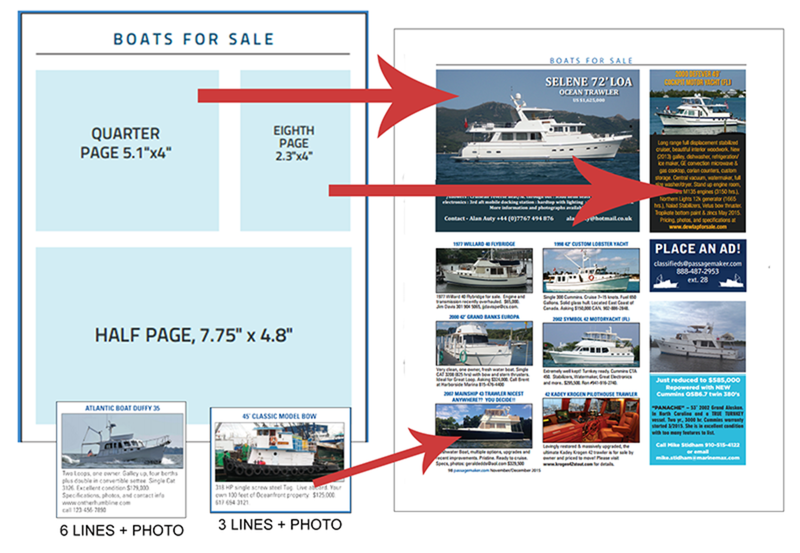 The standard ad costs $310 or $155 per issue, per boat. Our larger ads are also for single listings but can include multiple pictures and more text. Contact Carolyn Newman for details and exact pricing. For further questions or to get started, call or e-mail Carolyn Newman at cnewman@aimmedia.com or 860-767-3200 ext. 231.